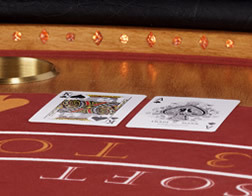 Big Slik proudly announces the launch of our newest line – Black Jack Tables! Just as with our poker tables you can expect nothing but the highest quality, most customizable, one of a kind tables you will find anywhere. These tables come in the same four styles as our poker tables Traditional, Luminescent, Championship and Elite. Contact us at 770-656-0131 or sales@bigslikpokertables.com and we can get to work on designing a truly unique table for your home.